Raquel Ormella has a diverse practice that includes video, installation, drawing and creating zines. Her work investigates the means by which critical inquiry in contemporary art encourages self-examination, deepening levels of interrogation into broader social and political issues. 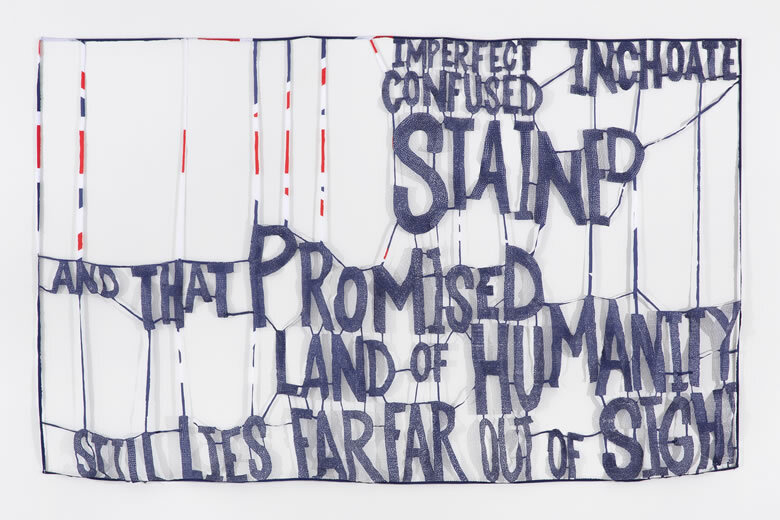 Her work questions whether we can collectively acknowledge and re-address the continuing stain of colonial dispossession of Aboriginal people, environmental destruction and racial and gendered violence. In her work Problematic Fragments #2(Deakin)2019, Ormella refers to a note which Australia’s second Prime Minister Alfred Deakin wrote in his private journal in 1913, recording his sense of unease at the state of the world and the opportunities he had ‘missed, neglected or ignored’. Ormella reflects on Deakin’s words, which echo thoughts and doubts artists have about their own practice. By quoting a prominent Federation-era politician telling us that the ‘national’ project was neither finished nor perfect, Ormella suggests that we should not try to fix our inherited flag, constitution and identity, but continue to find ways to move towards that 'promised land' still far out of sight.